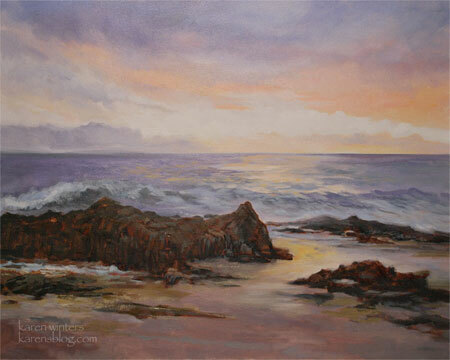 This painting is currently on exhibition in the San Clemente Art Association Gallery, in San Clemente, CA. Much of the week in San Clemente we experienced “June gloom” – that cool gray marine layer that covers the seacoast until early afternoon. 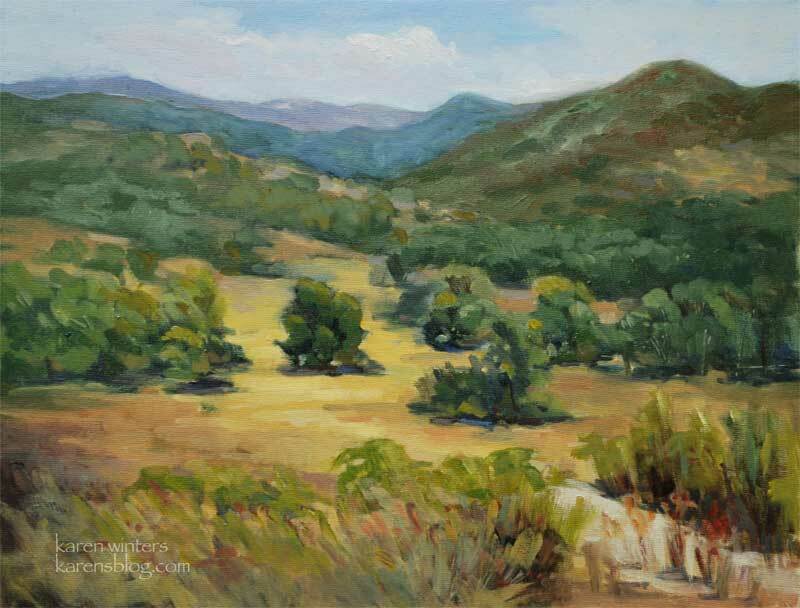 Although paintings in the gloom do have a certain mystery to them, I was looking for a more colorful subject, and so we traveled inland along the Ortega Highway to find this vista at Caspers Park. But really, it could be anywhere in the state – the golden hills studded with oaks is so typical of our scenery. If the light is rapidly changing, though, all bets are off, and sometimes you just have to paint whatever is most ephemeral. 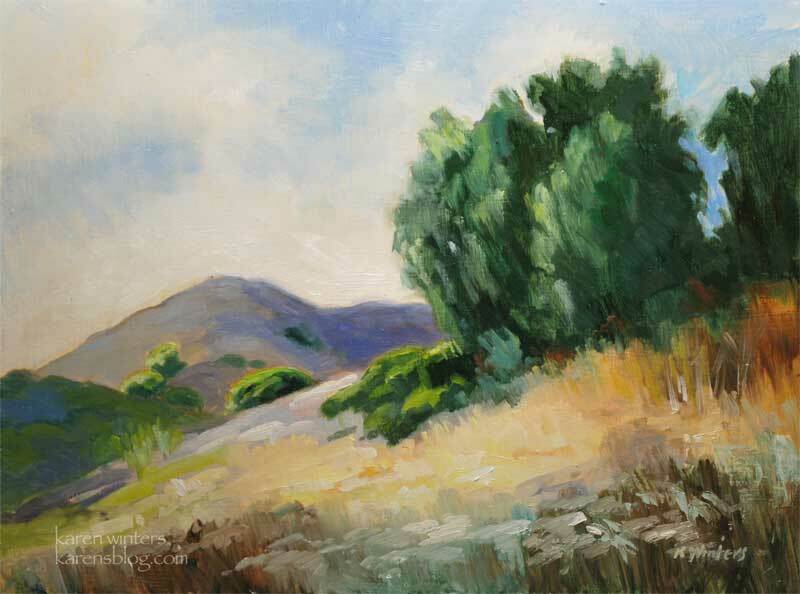 In this case, I knew that the cloud shadows might go away, so I painted them first, saving the golden grasses for last. 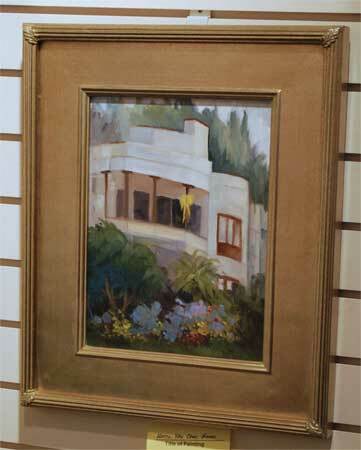 This painting is on exhibit at the San Clemente Art Association Gallery, until July 31. If you are not in the area but are interested in purchasing, please write me and I will contact the gallery. This was one of the paintings I did for the plein air paintout – at the end of a very long day painting in other locations. It portrays the silvery bay in late afternoon light from the vantage point of Salvador Drive, up Presidio, east of the city. The sun was just out of the frame, and I was trying to keep it under the brim of my hat – not easy! 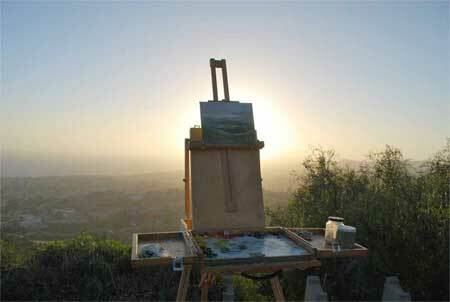 My husband took this picture of the painting on the easel at the end, just as the sky was starting to turn warmish. I thought it looked kind of neat backlit by the sun. More of my work from the paint out will be posted all this week, so please check back. The paintout continues in San Clemente. 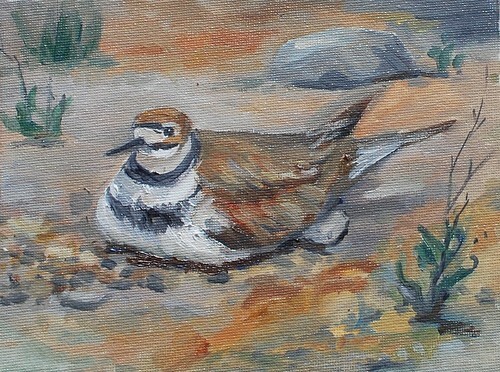 Today, I had a rare opportunity, very unexpected, to do an oil painting of a bird from life. We were walking along a bluff in Dana Point and suddenly saw a kildeer guarding its nest – only a few feet from where we were walking. The brave little bird stood its ground even though we were very close. I found a place to sit down about 6 feet away and my husband brought me a small 6 x 8 inch canvas panel and a palette and my plein air bag. I didn’t want to take the risk of standing up at an easel and scaring it – and besides, I was closer to it on the ground. For more than an hour the bird sat motionless except to occasionally turn its head. Eventually it stood up and called to its mate for a break. It is a kildeer behavior to take turns incubating the eggs. I have never had the privilege of painting a wild animal (not caged) from life before and hope that sometime it will happen again. Although the eggs were completely under the bird, I took the liberty of showing one partly exposed. They are speckled black and gray and blend in perfectly with the rocky sandy ground where they are laid in a shallow depression. I won’t be entering this painting in the San Clemente competition although I will have it for sale in my booth. 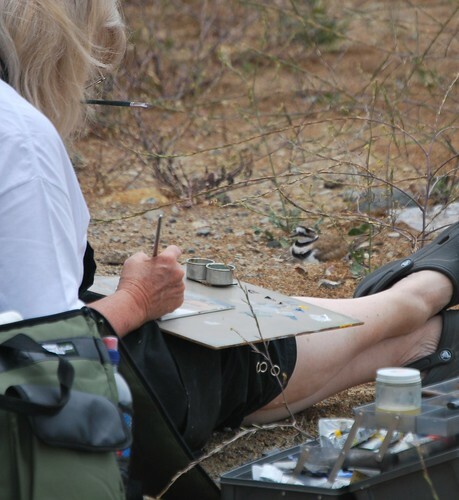 I doubt that anyone would believe it was “plein air” – imagine a bird sitting still for an hour. And yet, it happened! Late afternoon light casts long shadows across the pasture of this peaceful ranch in Fallbrook, California. When I was there painting, the peepers had already started their songs in the nearby irrigation canals. Spring grasses have turned to summer gold, perfect for grazing. This weekend, June 27-28, I’ll be at the San Clemente Art Association Annual Show and Sale on the lawn by the community center. Dozens and dozens of plein air painters will be there, so I hope you can stop by if you live in that vicinity. 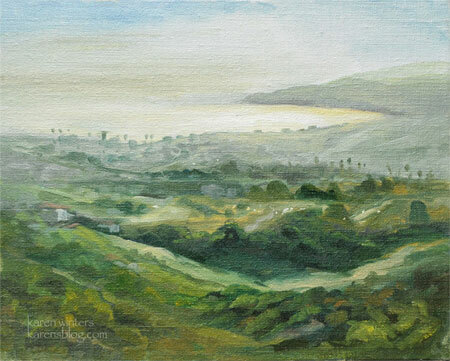 This was the painting that I did for the QuickDraw phase of the San Clemente Art Association annual paintout. A quick draw is a timed competition – from the stamping of panels to the final horn, we had exactly 3 hours to get to a location, paint a painting, get back and frame the painting and turn it in. It may sound like a lot of time but when you take off travel time and setting up an easel and packing up, the time really flies. The weather has been very gray in San Clemente (think: June gloom) and it hadn’t burned off by 12:30, the start time. With this in mind, I looked for something to paint the day before that would have a spot of color. When I saw this yellow ribbon hung on the balcony of an apartment building, I made it my choice. San Clemente borders Camp Pendleton, the Marine Corps base, so I’m guessing that someone who lives in that apartment has a loved one in the service, and the yellow ribbon represents waiting for their safe return from overseas. The apartment is on the corner of Santa Barbara and Del Mar, if anyone knows who lives there. The painting is currently hanging in the San Clemente Art Gallery in the Community Center. If no one takes it home before Friday, it will be in my booth for the Saturday-Sunday show. I am continuing to paint in San Clemente and Orange and San Diego counties for the rest of the event. I’ve got three additional paintings finished, and more to come by the end of the week. 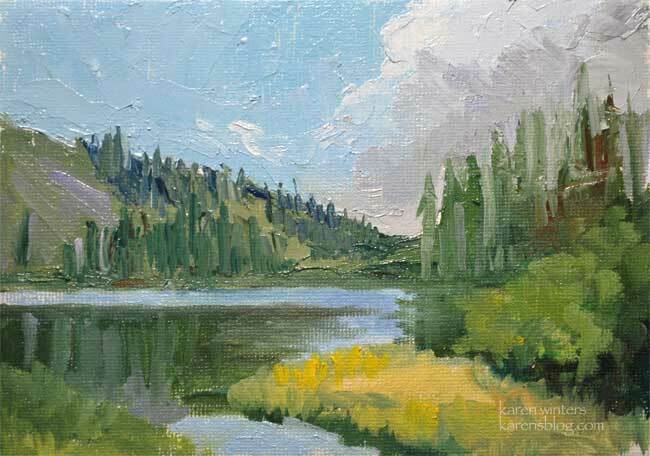 Just a quick study of Mammoth Lakes, California, from a trip we took long ago. I’d like to get up that way this summer and paint on location. I did some watercolor plein air paintings many years ago – including one sitting on a rock in the snow. Cold, but fun! This California landscape oil painting was inspired by a pepper tree I saw leaning into the wind on a golden hill. The spring green grass has turned to gold, now, and even though we are experiencing more than a usual amount of “June gloom,” the sun occasionally breaks through. When it does, it’s wonderful. Over the weekend we had the opportunity to see the new California Art Club associates show at the Women’s City Club in Pasadena. After that, we went to the opening at Segil Fine Art in Monrovia. An art-filled weekend in the very best way. 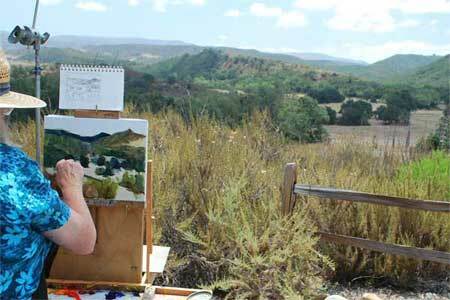 Now, I’m getting ready for next week’s plein air paint out in San Clemente. I have 25 paintings framed and ready to take with me for the final sale June 27-28. If you’re interested in this painting, please write. From the moment I saw this California cypress tree I knew I had to do an oil painting of it. Most of my tree experience comes from the big four: eucalyptus, oaks, sycamores and palms. 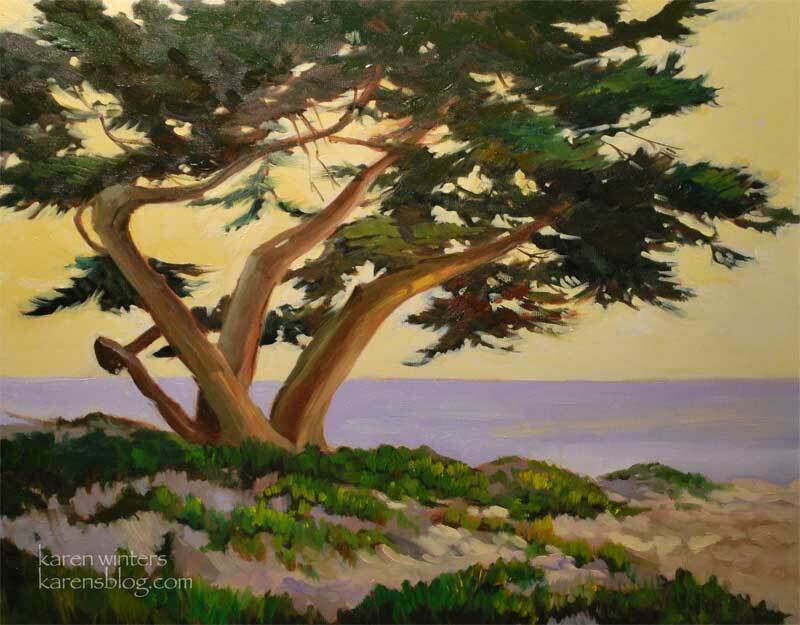 Cypresses only seem to grow natively near the ocean and they are almost always sculptural in form and are icons of California art. The iceplant growing at its roots, in the sandy dunes, provided an interesting textural contrast. This painting was done in anticipation of the San Clemente paintout and sale, which will start a week from Saturday and continue through the following Saturday and Sunday, June 27 and 28. This will be my first year participating and I’m really looking forward to it. 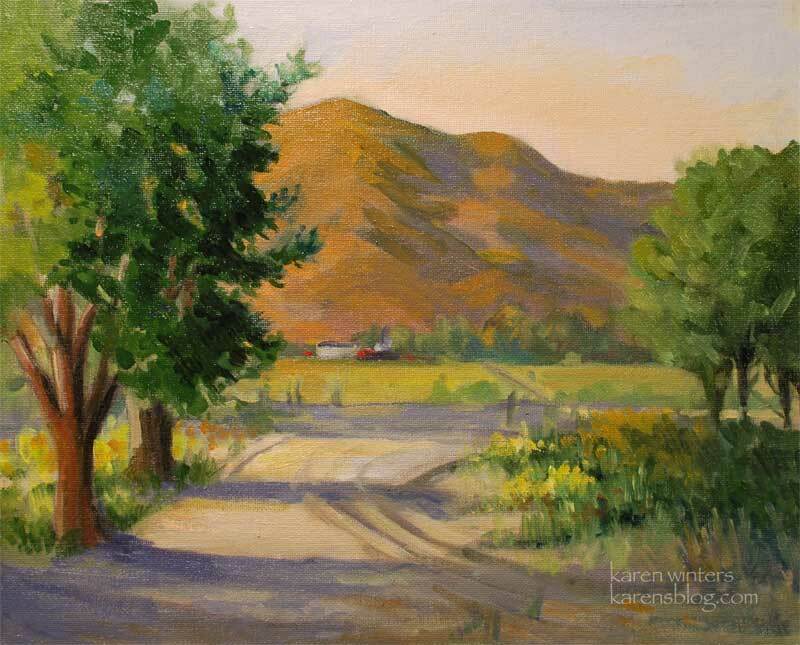 I have painted before in the San Diego County area, most recently for a week in Fallbrook, and I think the country is beautiful. I’m not sure yet whether I’ll be doing ocean scenes or some of the lovely inland areas, but I know it will be a great experience either way. The small Laguna Tide Pool study sold last week at the Rancho Santa Ana Botanical Gardens show, and this larger painting, based upon that study, was already under way. 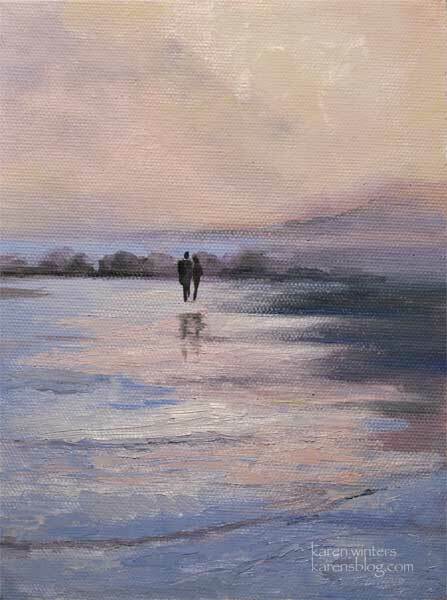 A romantic stroll on the beach, the water rolling up gently on the shore. If you live near a coast I’ll bet you have a memory or two, don’t you? I’m thinking seaward these days, getting geared up for the San Clemente paint out the week of June 20 – 28, culminating with a two day show and sale. The plein air painting should be great – I’m really looking forward to it.